Hello learners, this is the next course in the series of courses on Alexa Skills Development, which will help you get started with Alexa for business of AWS and build Alexa skills that will be suitable solutions for a business problem or improvements for already existing processes. 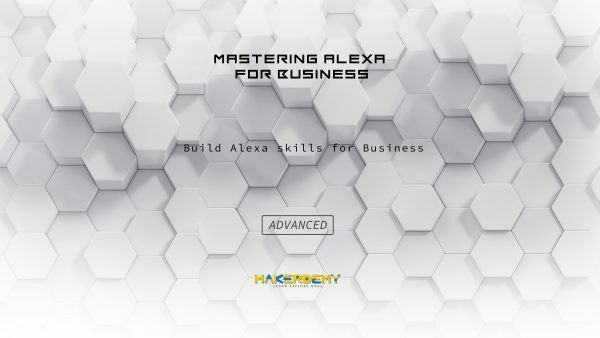 The course kicks off with the exploration of the features of Alexa for business, and then in the next section, we will develop a private skill that will help to improve the process of sending Emails within the organization. After that, in the next section, we will develop a private skill that will guide new recruits to get familiar with the places inside an organization and then, we will develop a private skill that will help everyone to send maintenance issues as slack messages and SMS alerts to the Maintenance team. Finally, In the last section, we will develop a private skill that will flash brief organization related announcements and news. The course gives detailed explanations for all the coding involved in developing these Alexa Skills and also has few projects that can help you to practice and master the concepts by yourself. While doing the projects and going through the course, you can feel free to ask your doubts on the Udemy discussion forum. You will get a response within one working day. Thank you and have a nice time learning.